Visit six islands in one day! Friendly staff on board, great group! One of my highlights of the trip for sure!!! This is an unbelievable tour. The staff was very friendly and entertaining. The speed boat was a pleasant ride and lunch that was provided was good. The islands themselves were incredible. The white sand beaches and the clear water was so nice to swim in. The snorkeling was also incredible. Would highly recommend visiting these phi phi islands if in phuket. It was good but not an amazing experience. The boat was old not in best of shape and it's crowded about 30 people at once for tour. The 1st islands is a tourist trap, crowded and the 2nd is ok but not amazing, from there the last couple islands are nice and the food was ok. They were accommodating on special diet needs. The crew was nice but most spoke very little to no English or any other language. The tour guide was nice but a little over the top on comments and invasive. So overall ok for the but I would say research better options. This tour was incredible, and probably a highlight for my whole trip to Phuket. We went to 6 islands, and the first one was very congested with tourists as it was probably the first stop for all of the tours. The second one was a private island and it was beautiful, our tour was the only ones there, the water was clear and the sands untouched. We did snorkelling and they stopped at an area with a lot of fish for us to see. I really enjoyed this trip because we got to see a lot of islands, some more busy than others i.e. Maya beach vs the private beach where we had lunch and we got a good balance of relaxing and adventure. The only thing that kinda annoyed us about this tour was that we had to pay a surcharge/extra for the transportation as we were not in the 'central' locations like Patong or Karon area where transportation was included in the price, but our resort was literally a 3 minute drive from the port whereas Patong/Karon would've been like a 40-50min drive... We probably could've even just walked to the port instead of paying for the transportation fees, or even paid for taxi and that would've been cheaper. Awesome tour. Totally worth it. Jeniffer tour guide and the crew were great! Hi, I'm very disappointed and feel I was victim of a tourist trap. - The tour description says: Small-group tour ensures a personalized experience, but we was more than 30 people in a boat. 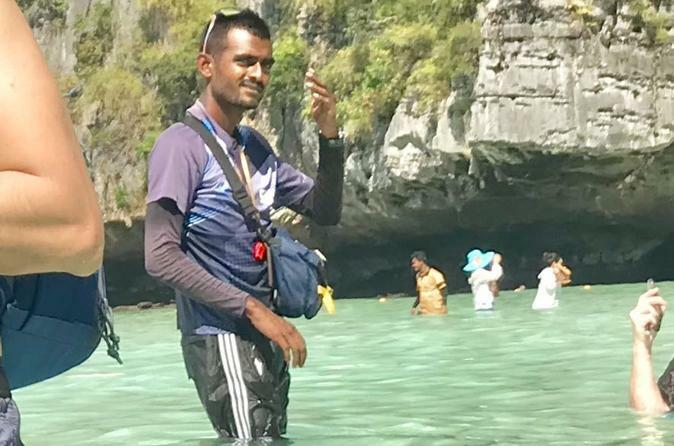 - The tour description says:you'll return to the pier on Phuket for a beachside barbecue dinner, but we received A SINGLE BROCHETTE meanwhile descending the boat, we ate standing, with stray dogs around. Huge difference between seaside BBQ dinner and this. Additionally, the quality and variety of the food in the lunch was less than average. There are many other bad things, but they can be considered just details. We made other shore excursions in Thailand and this is below the quality standard. The tour title says Deluxe but I can assure you It wasn't Deluxe at all. This was the worst tour ever for me and my wife. Reasons: The Guide was rude, arrogant and un providing, he in fact screamed at us me and wife because our hotel towels had little sand on it from the final island he took us to. And this screaming happened to an extend that each and every guest in the boat heard this and asked us as to why is the guide behaving this way and we should report this behaviour on all public travel portals. Further 4-5 things on the itinerary were never delivered, dinner, fins, 10 hours tour, 6 island considering the weather conditions were brilliant on the day. The boat was 100 filled with other guest deluxe tour suggested it will be few people on the boat and we were kept waiting at our hotel lobby for 30mins in the morning to be picked up considering we were staying on Patong beach Surf hotel. No one from the tour company even had the courtesy to call and inform us about the delay in pickup. This tour is amazing. I would check the meteo before going next time though..